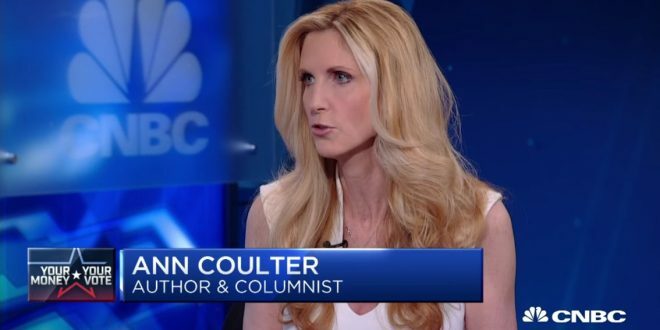 Ann Coulter: If Trump Backs Immigration Reform, One Option We Have Is Organizing Death Squads [AUDIO] - Joe.My.God. “We have made as clear as you can possibly make it, we want less immigration. Stop dumping the third-world on the country. If he continues down this path, well I guess there are three options. There’s the organizing the death squads for the people who ruined America, because there will be no more hope. I guess the other possibility is to – well I don’t think anyone would mind him being impeached. What’s the faction opposing that? And then at least we’ll get Mike Pence. But in terms of saving America, maybe a third party.” – Ann Coulter, speaking on Todd Starnes’ show on Fox News Radio.